As the year wound down, workers at Toushingama in Yomitan Village were busy making items of pottery in the shape of a dragon, next year’s Chinese zodiac animal. “Just as the dragon rises up, I really do hope that next year will be a good year for all,” said Masakazu Soma, the head of Toushingama. 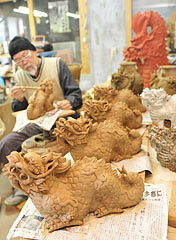 He worked hard to make sake jars and figurines decorated with the design of the dragon. The dragon is an auspicious creature – the only mystical animal of the zodiac. From around November, shops at Tsuboya in Naha, which sell pottery including lucky charms made by Soma, have even received orders from outside the prefecture. In Okinawa, people often also purchase such charms to commemorate the year of a child’s birth or as a gift.